Uber's Skywriting service will be for Valentine's Day only and will cost $500. If you live in New York, Los Angeles, Dallas, or San Diego you can order skywriting for your valentine from the Uber app. I don’t know about you, but every Valentine’s Day that I don’t get a personalized note above New York City in skywriting feels like a failure. This is basic stuff. But I have more hope than usual this year because Uber has teamed up with MasterCard and AirSign to offer customized skywriting. And for $500 it can be yours. On Valentine’s Day, Uber users in New York City, Los Angeles, Dallas, and San Diego can login between 10 a.m. and 6 p.m., enter a 12 character message, request “UberSKY,” agree to the $500 fee, and then wait for a call from an Uber rep for details about where and when to look skyward with your Valentine. Uber says that “demand will be high” and that users should “be persistent” when trying to order skywriting if they’re unable to on their first try. 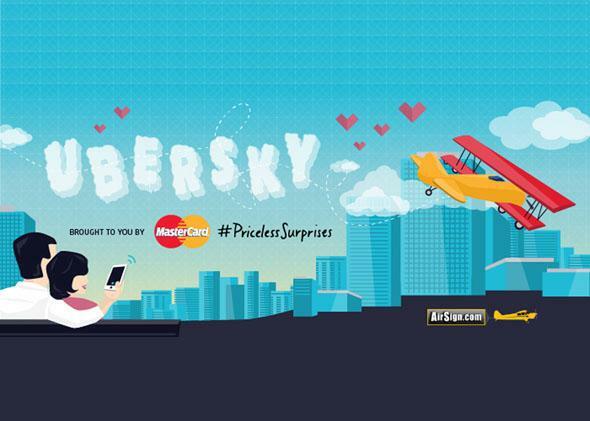 Apparently using a MasterCard may help, and you could win free skywriting. No word yet on congestion pricing, so presumably the $500 is fixed. Which is good, because that’s plenty.